Anxiety can also include panic attacks, specific fears, flashbacks, compulsions, or social anxiety. There are a number of effective treatments for anxiety such as cognitive behavioral therapy (CBT), eye movement desensitization and reprocessing (EMDR), exposure therapy, medication, stress management, meditation and mindfulness, and physical exercise. 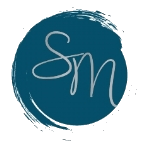 Please consult a licensed professional to find out what treatment is appropriate for you. How can I reduce anxiety at home? 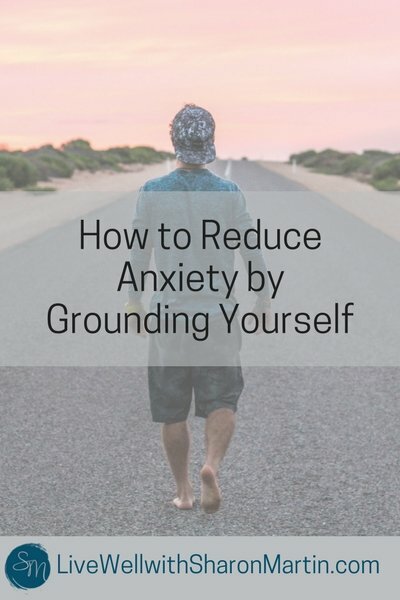 Grounding is simple and free strategy to reduce anxiety that you can use anywhere! Sounds good, right? Grounding distracts you from your worry and anxiety. It uses mindfulness principles to refocus your attention on concrete, observable things in the present. As the name says, it grounds you in reality so that your mind isn’t stuck in the past or future. There are very few “rules” to grounding. You can change the questions as they suit you and your environment. The key is to just get you to tune into observing and using your senses. It is important that you do the scaling (rate your anxiety on a scale of 1-10) so that you can measure whether the grounding is working. If your anxiety remains high, continue grounding yourself. 1. Rate your anxiety on a scale of 1-10. 2. Sit up straight and tall. Place your feet on the floor. Relax your shoulders. 3. Breathe slowly and deeply. 4. How many windows are in the room? 5. How many electrical outlets do you see? 6. What does the chair or couch you’re on feel like? Is it soft? Rough? Smooth? 7. What color are your pants? Your shoes? 8. What do you hear? 9. What material is the floor made of? Is it smooth or bumpy? Soft or hard? Dirty or clean? What imperfections can you see? 10. Name your favorite TV shows. 11. Name all of the types of shapes you can think of. 11. Rate your anxiety on a scale of 1-10. If it is still over a 5, repeat the grounding exercises. This is an excellent video (about 10 minutes) that takes you through the mental grounding described above as well as physical grounding (very gentle physical movements) and soothing grounding (thinking of things that provide comfort and enjoyment). They are all effective grounding techniques. You can use all or some of them depending on your preferences. 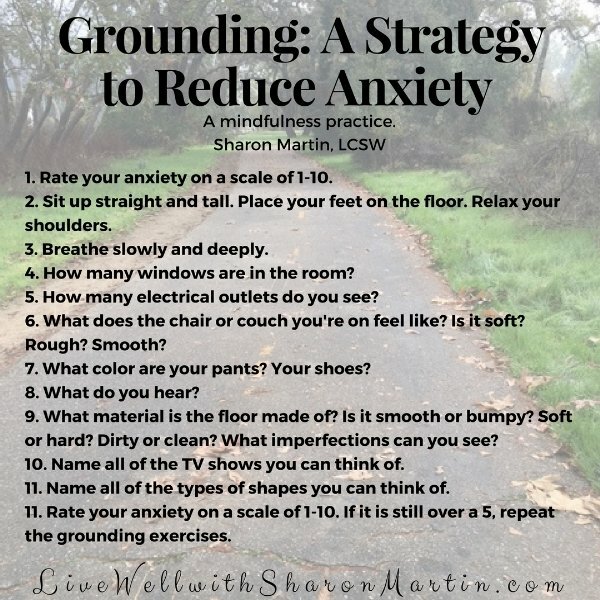 I hope these grounding exercises are helpful to reduce your anxiety.